The basic principle is based on rotation forces which enable it to mix different substances uniformly and bubble-free with extremely low energy outlay. Reusable and one-way mixing cups can both be used. 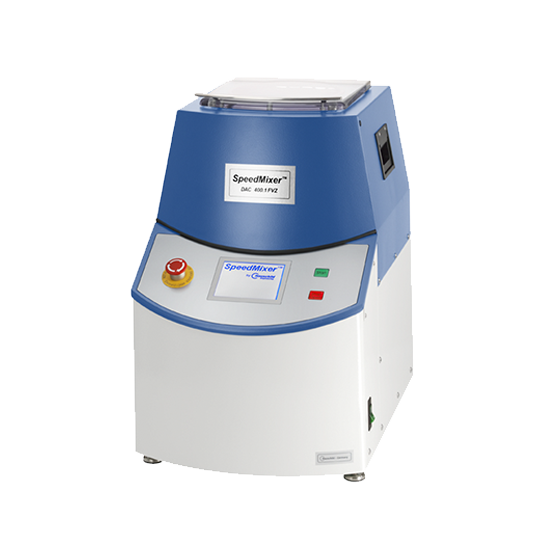 The mixing procedure of the devices of the SpeedMixer™ series is based on the double rotation of the mixing cup(hence the designation “Dual Asymmetric Centrifuge”). This combination of centrifugal forces acting on different levels enables very rapid mixing and the precision construction of the units gives them an equilibrium with a surprisingly low-noise operation. Mixing is a basic operation in process engineering. The primary objective is mainly achieving the required homogeneity of the new material. The mixing time and the energy outlay for the mixing process play an important role with regard to economic and process-technical aspects. The employment of mixing technology has been integrated into almost all branches of industry, such as in the pharmaceutical, biotech, electrical engineering, adhesive and composite technology, and paint and ink production sectors. The materials to be mixed can be of a different nature: extending from very viscous or scarcely viscous to pastes and powder, where this results in detail in different task definitions and challenges for the actual mixing technology. The objective of the mixing procedure is generally to generate a uniform and bubble-free product. This technology should be easy to operate and the results simple to reproduce. On the other hand, the abovementioned variety of materials to be mixed causes very special demands to be placed on the mixer. The Hauschild SpeedMixer™ is provided with a wide application spectrum and is characterised in particular by its diverse use: in first place are research & development, laboratories and quality assurance. Increasingly, however, it is also playing a large role in the production of small quantity lots in the most varied industrial sectors.